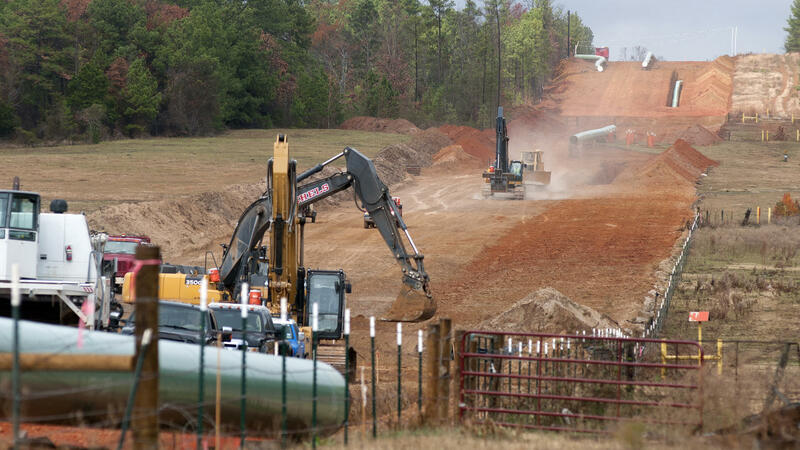 TransCanada already has begun construction on a southern section of the Keystone XL pipeline. Since it doesn't cross the U.S.-Canadian border, it doesn't require approval from the State Department and President Obama. Because the Keystone XL would cross an international boundary — between Saskatchewan and Montana — it requires review by the State Department and a special presidential permit. Environmental groups oppose the pipeline because the oil comes from Canada's tar sands, which requires a process that emits more pollution than traditional methods. At a Capitol Hill hearing on Thursday, Secretary of State nominee Sen. John Kerry was asked how he'll weigh the environmental consequences of the pipeline. He didn't answer the question but said the State Department is working on the application. "It will not be long before that comes across my desk and at that time I'll make the appropriate judgments about it," he said. The Keystone XL ultimately would move crude from Alberta south to the Gulf Coast. The original route through Nebraska's Sand Hills region was controversial. The company behind the project, TransCanada, proposed the alternative route. Heineman approved it, but not everyone in Nebraska shares his view. Jane Kleeb directs the group Bold Nebraska, which opposes the Keystone XL. She hopes President Obama, who has final say over the pipeline, will reject it. "I was so excited to hear him talk about climate change," says Kleeb, referring to Obama's inaugural address on Monday. In that speech, Obama said the country should lead the world's transition to sustainable sources of energy. "We will respond to the threat of climate change, knowing that the failure to do so would betray our children and future generations," Obama said as the crowd applauded. The president made no mention of the Keystone XL. Still, Kleeb took that statement as evidence he may reject the pipeline. "President Obama can't say those deep words about climate change and then turn around, with a straight face, and approve this pipeline," Kleeb says. At TransCanada's headquarters in Calgary, executives did not anticipate the years of sustained opposition the proposed pipeline has created. So it is understandable that now they are hesitant to predict that the process will go smoothly from here. "We don't entirely know what to expect," says TransCanada spokesman Shawn Howard. "We know that there's still a lot of work to do." Howard says the best his company can do is present its case to the State Department and the U.S. public. "If you're going to rely on oil for decades to come as a key part of your economy, would you rather get it from the Middle East, where you've got to move it by tanker, which isn't as safe as a pipeline?" asks Howard. And he repeats a point TransCanada frequently makes — that it's preferable to get oil from a friendly neighbor than from countries far away that may not share U.S. interests. Along with environmental concerns, that issue is likely to weigh heavily on both the future secretary of state and Obama in coming months. And I'm Robert Siegel. Should a pipeline be built across the U.S./Canadian border to carry oil from the sands of northern Alberta to refineries in Texas? We're talking about the proposed Keystone XL pipeline in this part of the program. A decision about its fate rests with the State Department. President Obama had held up the project, citing environmental concerns in Nebraska. BLOCK: But this week, Nebraska's Republican governor approved an alternate route for the pipeline, putting the approval process back on track. And it was on the agenda today as the Senate held a confirmation hearing for John Kerry to become secretary of state. Here's NPR's Jeff Brady. JEFF BRADY, BYLINE: Because the Keystone XL would cross an international boundary between Saskatchewan and Montana, it requires review by the State Department. Environmental groups oppose the pipeline because of where the oil comes from - Canada's tar sands. Producing that oil emits more pollution than traditional methods. At a hearing today, secretary of state nominee Senator John Kerry was asked how he'll weigh the environmental consequences of the pipeline. He didn't answer the question but said the State Department is working on the application. SENATOR JOHN KERRY: And I've already checked into it. It's under way. It will not be long before that comes across my desk, and at that time, I'll make the appropriate judgments about it. BRADY: The Keystone XL ultimately would move crude from Alberta south to the Gulf Coast. The original route through Nebraska's Sand Hills region was controversial. The company behind the project, TransCanada, proposed an alternative route. Nebraska Governor Dave Heineman signed off on it, but not everyone in Nebraska shares his view. Jane Kleeb heads the group Bold Nebraska, which still opposes the Keystone XL. She hopes President Obama, who has final say over the pipeline, will reject it. She points to the president's inaugural address Monday. JANE KLEEB: And I was so excited to hear him talk about climate change. BRADY: At the U.S. Capitol, Obama said the country should lead the world's transition to sustainable sources of energy. PRESIDENT BARACK OBAMA: We will respond to the threat of climate change, knowing that the failure to do so would betray our children and future generations. BRADY: Obama made no mention of the Keystone XL. Still, Kleeb took that statement as evidence he may reject it. KLEEB: President Obama can't say those deep words about climate change and then turn around, with a straight face, and approve this pipeline. BRADY: At TransCanada's headquarters in Calgary, spokesman Shawn Howard doesn't want to predict how smoothly the approval process will go from here. SHAWN HOWARD: You know, we don't entirely know what to expect. We know that there's still a lot of work to do, even though we just received that approval out of Nebraska, which was a really important part of the process. BRADY: Howard says the best his company can do is present its case to the State Department and the American public. HOWARD: I guess the question comes down to, if you're going to rely on oil for decades to come as a key part of your economy, would you rather get it from the Middle East, where you've got to move it by tanker, which isn't as safe as a pipeline? BRADY: And he repeats a point TransCanada has frequently made, that it's preferable to get oil from a friendly neighbor than from countries far away that may not share the U.S.' interests. Along with environmental concerns, that issue likely will weigh heavily on the future secretary of state and President Obama in coming months. Jeff Brady, NPR News. Transcript provided by NPR, Copyright NPR.